WEST PALM BEACH, Fla. — Moser Engineering has renewed its longstanding partnership with the International Hot Rod Association (IHRA). Moser Engineering will continue to serve as a major contingency program sponsor for the IHRA, and new this year, the Portland, Ind. 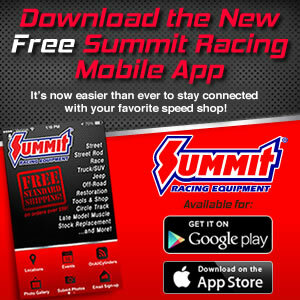 company is the Saturday race sponsor for the Summit Sportsman Spectacular Series. In addition to the 10-race sponsorship, Moser Engineering will provide a $300 product certificate for one Box and one No Box racer that will be presented to during the third round of competition on Saturday, which will be known as the Moser Money Round. There will also be a $150 certificate for one Junior racer. Moser Engineering is the leading manufacturer and supplier of high-performance rear-ends, drive-line components, brakes and suspension parts for the automotive aftermarket industry. Moser has been leading the competition since 1986 and continues to provide industry leading products and support for all Sportsman Racers. They are the IHRA racers source for quality America-made products, at an affordable price with the fastest turn around available on custom made to order axles, housings and center sections. The IHRA Summit Racing Equipment Sportsman Spectacular was created to produce a fun double-race weekend with increased purses that is affordable to grassroots, bracket-racing competitors who support their local tracks each weekend. For more about Moser Engineering and its line of products, click here. For more information on the 20-race IHRA Summit Sportsman Spectacular go to IHRA.com and click here to pre-enter for an upcoming event.